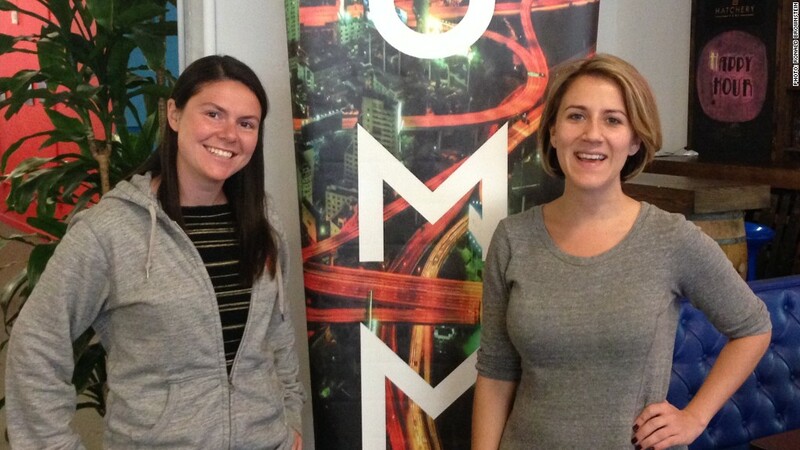 Julie Lein, left, and Clara Brenner, cofounders of San Francisco-based accelerator Tumml. The new technology economy has transformed communications, retailing, travel, journalism, dating, and pretty much everything else it has touched. Now it's also changing the form and focus of civic engagement. For a case in point, consider Clara Brenner and Julie Lein, cofounders of a two-year-old "business accelerator" known as Tumml. Brenner, 29, and Lein, 30, operate from a glamorously scruffy neo-industrial space that could be lifted from a movie about the start-up experience, with its location in San Francisco's trendy SoMa (South of Market) neighborhood, exposed pipes on the ceiling, and repurposed vintage diner booths in the communal kitchen. Brenner didn't even look up from her conversation the other day when one aspiring entrepreneur rolled by on a skateboard. Most of the young people huddling at the long tables around Brenner and Lein in the sprawling office are dreaming of launching the next Facebook (FB) or Uber. The two young women have a different goal: supporting a new generation of "urban impact start-ups" that aim to tackle civic problems, while turning a profit along the way. Their firm provides funding, mentoring, and practical guidance for start-ups that aim to address challenges from education to transportation to boosting local small business. "You open TechCrunch or The Wall Street Journal, and you read about start-ups changing the world through the next dating app or on-demand butler service," Brenner says. "It's pretty disheartening. They're not solving problems that at least Julie or I particularly care about. We wanted to see more start-ups solving real problems like homelessness and transportation." Related: How will Silicon Valley compete with New York? In their instinct to tackle such civic problems by incubating start-ups, Brenner and Lein capture a profound generational shift that is changing the way many young people think about contributing to their communities. Two or three decades ago, it's easy to imagine that someone like these women concerned with say, homelessness, might have expressed her values by trying to elect a local or national politician who promised to confront the problem by passing new laws. Or she might have volunteered at a nonprofit organization that directly provided a service. Brenner and Lein say they respect both of those options -- Lein, in fact, did try to elect politicians while working for a Democratic pollster after finishing her undergraduate degree. But each has concluded she can make a bigger and faster impact on the issues she cares about by nurturing private businesses that address them. "I thought if you get involved in politics, that's how you effect real change," says Lein. "But it's clear that the people getting funding and having the most rapid take-up of their ideas are in the entrepreneurial world. That's what drew me, even though I'm a do-gooder, bleeding heart." To Lein and Brenner, and the companies they are working with, starting a business isn't an alternative to civic engagement; it's a form of it. "More money equals more impact," Brenner insists. "So making sure [these companies] have a robust revenue model is critical to their ability to be good social entrepreneurs. That's something social entrepreneurs don't talk about enough." Brenner and Lein hatched the idea for Tumml when they met at the MIT Sloan School of Management. Brenner had spent four years working in real estate in Washington, D.C., before returning to business school, initially with the idea of acquiring the skills to launch her own real-estate development company. Lein worked in San Francisco for an economic consulting company, and then joined the firm of Stanley Greenberg, a prominent Democratic political pollster, before deciding on business school as well. As they grew friendly at MIT, the two women became increasingly interested in companies that combined a social mission with the profit motive. During business school, Brenner worked for a firm that created a crowd-sourcing tool that allowed community residents to invest in local real estate; Lein worked for an Oakland company that provided healthy school meals while also training local residents to contribute. "We were just so amazed by these companies in terms of the community impact they were having, but also their ability to scale really rapidly in a way that more traditional community organizations out there are just not capable of doing," Brenner recalled. "And we were wondering why there weren't more [of these] companies out there." While many business accelerators exist to nurture start-up firms in an array of industries, the two women could not find anything comparable to help entrepreneurs who wanted to tackle civic challenges. "If you want to solve a problem in your own community, in your own backyard, there isn't really a place for you to go," says Brenner. "Where would you go find money to do that? I couldn't have told you two years ago. So we decided an organization to try to change that." Interest became avocation after the two women finished business school in 2012: With funding initially from the charitable arm of the Blackstone Group, they formed Tumml and moved to San Francisco. Since summer 2013, they have selected three groups of young companies (some 17 in all) from hundreds of applicants based everywhere from Kansas City to France and Germany. For each firm that makes the cut, Tumml provides some initial funding, a place to work, access to mentors, a curriculum that offers guidance on the usual challenges of business formation -- and, most distinctive of all, opportunities to interact with local government and nonprofit leaders working on the same issues that the entrepreneurs are tackling. "They have a wonderful network of entrepreneurs, investors, civic leaders that were introduced to us once or twice a week," says Ali Vahabzadeh, cofounder and chief executive of Chariot, one of the firms Tumml has supported. Though slightly older, Vahabzadeh, 37, embodies the same generational shift in perspective as Brenner and Lein. When he saw a problem in his community, he concluded that the best way to address it was not to lobby government, but to start a company that directly addressed the need. The problem that motivated Vahabzadeh was public transportation in San Francisco, which didn't match his previous experiences in London and New York City. After relocating to the Bay Area in 2010, he recalled, "The first thing I realized was, I can't get around this town." He bought a bicycle, but recognized that wasn't an option for everyone. And so, last winter, after leaving a job at a real-estate start-up, Vahabzadeh founded Chariot, a private transportation company that runs vans along crowded commuting corridors in the city. "I just decided that most likely it was not going to be the city or transit agencies that [would] overnight have an awakening and improve all of our commutes, and I didn't see any private options addressing this need either," he says. "So I took it under my own hands, and I thought an entrepreneurial solution was the fastest way to alleviate the commuting issues we had." Only about six months after launching, Vahabzadeh is now ferrying 2,000 riders a week and expanding to a second route that he devised with crowd-sourcing input from potential riders. Tejal Shah, the founder of KidAdmit, another company Tumml has supported, paralleled Vahabzadeh's experience and response. When Shah, 37, sought to enroll her child in a private preschool a few years ago, she grew frustrated at how the process seemed frozen in the pre-digital age. "Each school had a paper application; it was the same thing over and over again," she recalled. "There was a lot of time being spent with very few questions being answered." The thought of working through local government to encourage or compel preschools to streamline the process never crossed her mind; instead, after recruiting a cousin to join her, she formed a company to create an on-line common application for preschools in the area, much as colleges use. Now she is working with 152 San Francisco private schools -- providing parents not only a common application but also more easily accessible data about the schools -- and expanding into eight counties surrounding the city. Neither Vahabzadeh nor Shah see themselves as supplanting government or nonprofit organizations; their goal is to supplement them with companies they believe can respond more nimbly to community needs. That's the perspective Brenner and Lein share as well. "This is certainly not a libertarian operation, we are not looking to replace government," says Brenner. "Many of the individuals who have gone through our program wouldn't think of themselves as particularly politically active or civically savvy. ... I think this is a way of making people feel like they actually can exert some control over the problems they encounter every day. And that's good, but it's not like they're trying to take over the job of a politician or put nonprofits out of business. It's more that whatever we have done so far has not been adequate to solve the problem, so why not add another tool to the tool kit." Not all challenges facing America's cities may respond to this hybrid approach of private profit and public purpose (though one start-up that Tumml has supported provides a way for people to contribute directly to the homeless). And doing well may collide with doing good more often than these young entrepreneurs now anticipate. But Tumml and the like-minded young entrepreneurs in its orbit are remixing characteristic millennial-generation attitudes of social responsibility, skepticism of big institutions, trust in technology, and a preference for direct action -- and, in the process, redefining civic activism for the digital age.